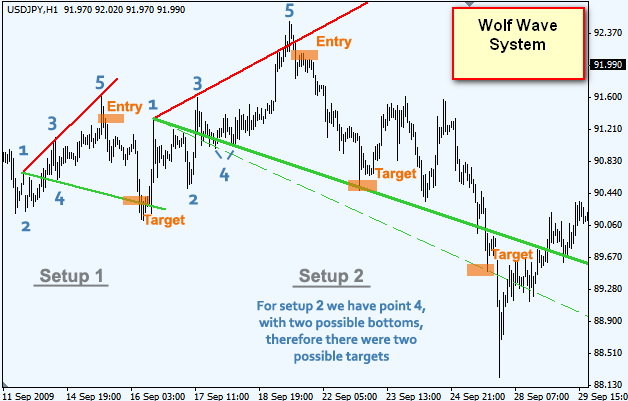 Wolf Wave system is particular methodology that perhaps the most unique, effective trading technique I've (Linda) ever come across! It was developed and shared by a good friend, Bill Wolfe, who for the last 10 years has made a living trading the S&P. His son, Brian, also trades it. Brian was the first teenager I've ever met who consistently made a good income scalping NYFE (Knife) futures from his apartment. Brian, now 21, has expanded into trading the Wolfe Wave in other markets. Bill's theory of wave structure is based on Newton's first law of physics: for every action there is an opposite reaction. This movement creates a definite wave with valuable projecting capabilities. This wave most clearly sets up when there is good volatility. With a bit of practice, it is easy to train your eye to spot these patterns instantly. 1. Number 2 wave is a top. 2. Number 3 wave is the bottom of a first decline. 3. Number 1 wave is the bottom prior to wave 2 (top). Point 3 must be lower than point 1. 4. Number 4 wave is the top of wave 3. The wave 4 point should be higher than the wave 1 bottom. which we will call wave 5. this is the entry point for a ride to the epa line (1 to 4). IMPORTANT POINT: You cannot begin looking for the Wolfe Wave until points 1, 2, 3, and 4 have been formed. Keep in mind that point 3 must be lower than point 1 for a buy setup. It must be higher than point 1 for a sell setup. Also, on the best waves point 4 will be higher than point 1 for a buy setup and lower than 1 for a sell setup. This ensures that absolute runaway market conditions do not exist.